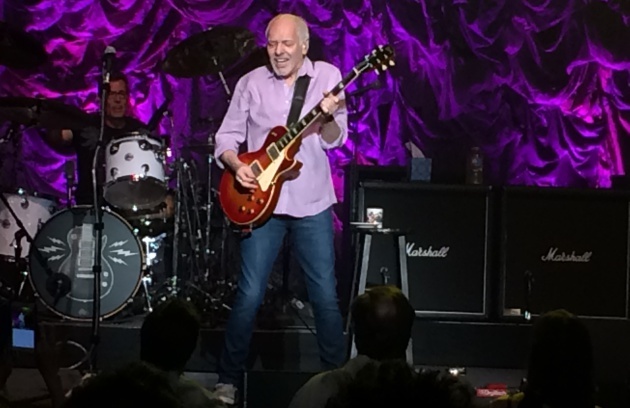 Before the lights went dark, a recorded message from Frampton was played, telling fans to limit their photo and video taking to the first three songs – and thereafter no use of cellphones, not even for texting. Ushers actively enforced the policy during the rest of the evening. Frampton played a generous 2 1/2 hour set, which included an overlong five-song acoustic segment plus covers of Buddy Holly, Soundgarden and numbers associated with two of Frampton’s late pals, David Bowie’s “Rebel Rebel” and George Harrison’s “While My Guitar Gently Weeps.” He said not a word about Bowie, his old school mate, but told a story about Harrison, including doing a vocal impression of the late Beatle. The cheery Frampton was chatty between songs, trying to be witty with a hint of sarcasm. However, as a guitarist, it was not about entertaining. It was about the music, with Frampton often facing his sidemen not the audience as he delivered fresh, largely improvised solos. He was clearly trying to communicate with his players – and let the fans come along for the ride. The guitarist’s tone, technique and versatility were impressive. In the course of the evening, he played everything from flamenco and blues to jazz-rock fusion and hard rock. Frampton may not be the most emotional or soulful guitarist but he’s a master at building a solo to elevate the song. Frampton’s four-man backup band featured two Minnesotans – keyboardist Rob Arthur, who has toured with Frampton for 11 years, and bass man Paul Peterson, whom Frampton called “one of the finest bassists ever.” The way Frampton interacted with his bandmates was alluring in a jazz ensemble sort of way. You could tell the bandleader was getting off while exchanging licks with guitarist Adam Lester or keyboardist Arthur. The 66-year-old British hero was clearly in great spirits. He delivered 23 songs, compared to 18 numbers the night before in Mankato. In case you weren’t aware, Frampton no longer has the fluffy curls that were his signature in his 1976 heyday. He joked about that. Judging by the enthusiasm of the 40- and 50-something women in the audience, it didn’t matter. They still love his way – with a guitar.